Mario Party 10 is the latest in a long line of first-party Wii U games that gets almost everything right and it’s perhaps this fact—that it comes so very close to setting the standard—that makes its shortcomings sting all the more. The Mario Party series has always been a bit divisive. In its earliest days, it made a fast name for itself with the friendly rivalries that its luck-based, backstabbing-heavy gameplay made among friends who had ALL THEIR STARS STOLEN BY KEVIN ON THE LAST TURN. After a few years and Final-Fantasy-esque sequels, arguments began to arise outside of gameplay over which particular numbered entry was the best. Then, in 2012, Nintendo decided this wasn’t enough and applied a major change to the well-worn Party formula for the first time in the series, and fans began to quarrel over which style of play is best: is it the classic, every-man-for-himself free-roam board game or the new, streamlined car-full-of-frenemies road trip? With gamers and critics all falling passionately on either end of the pendulum, it makes sense that Nintendo would try answer the question of which is best with Mario Party 10, but the answer it gives is half-hearted and unsatisfying. As with any Mario Party, minigames take center stage in Mario Party 10. This time around, they'll use buttons, pointers, and motion controls for everything from platforming challenges to quick time events to memory games and giant boss battles. For those unaware, the premise of Mario Party 10 (like the rest of the series) is simple. Players take turns rolling dice to move around a virtual board game, pausing to partake in various events and minigames along the way, with the ultimate goal of ending the game with the most (mini-)stars as possible. This latest edition to the franchise gives players three main game modes, Mario Party, Bowser Party, and amiibo Party, supplemented by a few standalone single and multiplayer minigames, a free-play of Mario Party and Bowser Party minigames, and a round-robin minigame tournament for up to eight players. These latter additions are nice extras, but not where you’re likely to spend most of your time, unless you’re in desperate need of a secondary game for your Eight-Player Smash nights. The first thing on most players’ minds when Mario Party is mentioned are the minigames, as they, along with unlockables, are what’s most likely to keep you coming back. The unlockables in Mario Party 10 won’t excite most players. The Toad’s Room store contains two unlockable characters, new skins for vehicles, tracks of existing game music you can listen to in a separate menu, and various 3D models for a simplified version of the Super Smash Bros. trophy photo studio. The minigames, however, are some of the best since the series introduced motion controls. Yes, this entry continues that trend and Wii remotes are required, but thankfully MotionPlus is not, so those dusty old white remotes you have in a drawer from your launch edition Wii will work just fine. Mario Party 10 brings 75 minigames to the table, most of which being variants on past examples. That said, while they most may not be particularly groundbreaking, the minigames this time around do a much better job of eliminating the luck factor, making most games a test of some level of skill. Some are still heavily influenced on chance, but the majority will test your thumb (or wrist) speed, your reaction time, your memory, or your platforming prowess. It’s worth saying that while luck has been cut out of most of the games, that doesn’t mean that all are fair. On occasion, players will run into 1-vs.-3 minigames, in which one player fends for himself trying to outwit the others. These are a noticeable mixed bag. Some are fairly even matches between the team and the loner, others give a considerable advantage to the person acting alone, and still others appear nearly impossible for the single player to win. These are few and far between, but it’s worth mentioning for those who prefer to feel at fault for their losses. It's nice to see Mario finally accept that most parties have more than four people, but after seeing simultaneous eight-player modes work so well in Super Smash Bros. and indie title Runbow, it's disappointing that the game boards and minigames themselves are all still restricted to a max of four. The best minigames, however, come in the heavily advertised Bowser Party mode, a first for the series, made possible by the powers of the Wii U Gamepad. In Bowser Party, four players hop into a vehicle, taking turns rolling the dice to move their vehicle as far down the track as possible. Once all four have rolled, it’s Bowser’s turn, controlled by a fifth player with the Gamepad. In this mode, the non-Bowser players start the game with health points with the object being to stay alive until the end of the board where they receive the Grand Star. If Bowser catches the vehicle, however, he gets an opportunity to wreak some havoc with one of the ten 4-vs.-Bowser minigames. These are highlights of the experience with interesting twists that are generally fair to all involved. This mode is the clear standout of Mario Party 10, and the tension of an ever-encroaching giant Bowser behind the party is palpable and exciting, but even this misses the full extent of its potential. First, there are only 10 minigames playable in this mode. Even though they are among the best in the game, having so few means they grow stale more quickly. And, even though Bowser Jr. will sometimes try to tip the scales in Bowser’s favor with an extra roll or pro-Bowser trickery, the minigames are only triggered when Bowser catches the vehicle. This means that the luck of the roll is a heavy factor in the mode’s enjoyment. This reviewer, in fact, played one game in which Bowser never caught up to the other players, creating a rather boring half hour of nothing more than dice rolls. Also new to the series is amiibo Party. Utilizing amiibo figures of Mario Party characters in the Super Mario Bros. or Super Smash Bros. range, players tap and hold their figure to the Gamepad to roll dice, participate in board-specific events and activate power-ups saved to their figure that can do anything from granting additional dice to revamping the playing board. This mode also brings back the classic Mario Party series style in which each character moves on his own with his own dice roll, collecting coins and buying stars at specific points along the way. There are no minigame spaces on the board, so games are played in between each round; the game ends after 10 rounds with the winner being the one to have collected the most stars. The amiibo integration here works surprisingly well, getting players physically involved with the game board, as if you were playing a real tabletop game. Yet, while this is a nice addition for those who prefer the classic gameplay and are already building an amiibo collection, it ultimately falls a little flat. Not only is it only accessible if you have an amiibo figure for each person wanting to play (an additional $52 investment, minimum, for a four-player game, which is more than the cost of the disc itself), but all of the boards are overly simple squares of the same size. 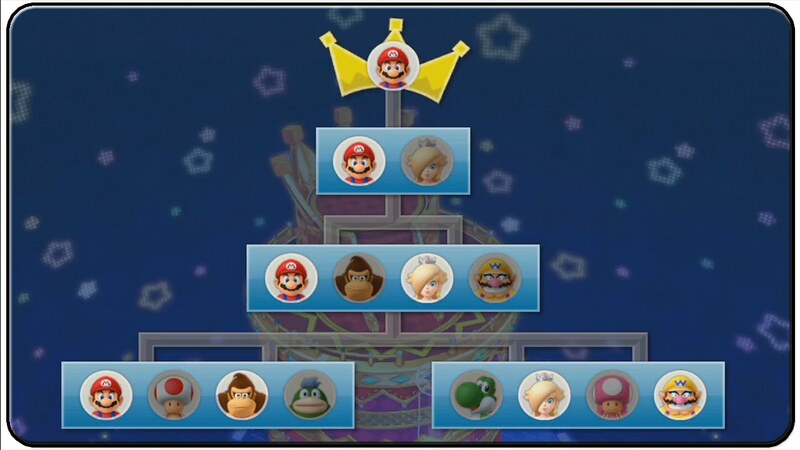 There are minor differences in the events scattered around the character-themed boards, and it’s nice that you are able to use boards for characters not currently playing (meaning a single game could potentially involve pieces from up to five different boards), but the differences between boards are minor, and most players will simply be left pining for the complexity of Mario Party’s past. Completionists should be warned as well, if you want access to all of amiibo Party’s content, you’ll need a Rosalina figure in addition to the not-yet-released Wario. Good luck. The amiibo Party boards bring back the gameplay of classic Mario Party boards, but none of their charm. Finally, we have Mario Party, which, as the name would imply, is the core of the game. Whereas in prior games, special spaces, minigames, and board events gave players coins with which they could purchase stars at various checkpoints—much like they do in the amiibo Party mode—in Mario Party 10, the coin middle-man is gone and “mini-stars” are the only thing that matters. As with Mario Party 9, Mario Party 10 sees all four players again jump into a single vehicle to travel along a much straighter, simpler board, rather than each player finding his or her own path. There are five boards to choose from, each with its own hazards and gimmicks, from the simple Mushroom Park to the devious and aptly named Chaos Castle (which will actively try to rob you of everything you’ve spent 20 minutes working toward). Along the way to each board’s goal, you’ll run into various stage-specific hazards or bonuses, lots of minigame spaces, and two boss battles, gaining or losing mini-stars at each stop. The four players each take turns rolling dice to move the vehicle forward, with whoever’s at the wheel reaping all the benefits or consequences of their roll. Slightly disappointing in this mode is the usage—or lack thereof—of the Gamepad. While the tablet controller is integral to the Bowser and amiibo Party modes, in Mario Party, the only use is to display an image of Bowser trapped behind numbered bars. When all numbers 1-6 have been rolled during the gameplay, Bowser will break out of jail and unleash a random hazard or setback on the unlucky sap who rolled the last number. It’s nice that the second screen does something, for sure, but it isn’t an engaging function. If you’ve played prior games, but skipped Mario Party 9, the unified mode of travel will be the biggest change you’ll notice and, to Nintendo’s credit, it really does a lot to shake up the aging formula. It streamlines the game and ups the pace, assuaging concerns that a round of Mario Party was too big a time commitment or that there were too many gaps with boring dice rolls. This is why the new approach has found some fans, but while the faster pace is its own advantage, the Mario Party experience loses a lot of charm in the transition. Since its beginning, Mario Party has been an almost exclusively local multiplayer experience because the real joy of the games come not from the interactions on-screen, but the ones on the couch. The older formula was famous for its family-friendly coating on cutthroat gameplay tactics. Susan’s ahead by three stars? Let’s all join up and prevent her from winning more minigames. James has a chance to steal one of Susan’s stars for himself? Nope, he steals Marcus’s only star, instead, because he can. In older Mario Party games, nights were filled with more conniving, rib-jabbing, alliance-building, and backstabbing than the first three seasons of Game of Thrones. The memories were built on the laughs and taunts and last-minute triumphs and downfalls that took place inside the living room, rather than the content of the minigames that took place inside the game world. And this is where Mario Party 10 most feels like a miss. With everyone in the same (literal) boat, this real-world dynamic is almost completely removed. It’s clear Nintendo tried to do something different with Bowser Party (which mostly paid off) and it’s obvious the developers tried to appease fans of the classic formula with amiibo Party, but all things considered, it just feels like a half measure. With all players traveling together on the same straight path like this one, Mario Party 10 loses a lot of the "anything can happen at any time" excitement of its predecessors. This board's latter half (not pictured) does a better job of throwing chaos your way, but the moments are fewer than series veterans will remember. With Mario Party 10, Nintendo seemed to play the mediator, attempting to placate both camps on which party style is better. With perhaps a little more time, the game could have done what it tried to do and featured full-fledged versions of both Mario Party gameplay styles, as well as adding the amiibo functions and a more robust Bowser Party mode. But as it is, Mario Party 10 feels like only half an answer to that debate and makes this reviewer wonder if it were rushed to shelves to fill a void in the Wii U release schedule. With the system in the state that it has been, that’s an understandable financial decision to an extent, but it’s no less disappointing for the player. Even the game’s unusual $50 price tag seems to indicate that Nintendo understands the situation. It seems to acknowledge that the Mario Party name will help it sell more than the Wii U’s $40 “budget line” (Captain Toad: Treasure Tracker, Kirby and the Rainbow Curse, and Game & Wario), but it still doesn’t have the content or quality to justify the standard triple-A $60 tag. Mario Party 10 is certainly not an unenjoyable game. Graphically, the game is bright and appealing, and the music is upbeat and pleasant. The three modes each offer a different perspective to keep things fresh over a few plays, and the eight-player minigame tournament can be a blast for big gatherings with the right people. But having so few boards and minigames will leave most wanting more. If you’re looking for something as raucous and engaging as Mario Party is known to be, you’d do better to dust off a Gamecube or N64 for your next party. It’s a darn shame, but Mario is nearly 35 years old now. He just doesn’t party as hard as he used to. Wow this has got to be the longest review on our entire site! Nice work @bro2dragons! Whoa this review is super huge! This must have taken forever to type! I can't stand the new Mario Party games. Characters shouldn't travel together as that makes a board game rather tedious. Thanks for the... compliments? Haha. I know this review ran a little long, and apologize for that. With all the potential this game had, I just felt it worth discussing WHY the game mechanics don't quite work. I hope the review is helpful for anyone on the fence. Excellent review! So much detail too. It seems I now have a pseudo-rival in the WiiWareWave super-long-and-detailed review field. Excellent work, @bro2dragons! Thanks, guys! I appreciate the encouraging words to a new reviewer. Mario Party has gone downhill since MP7, but MP9 and MP10 don't even feel competitive anymore with the entire group travelling together. I'm not sure about the team-up gameplay in 10, but I'm still curious nonetheless, so it's on my wishlist of Mario Party games. I'd especially like to try out Bowser Party. Your review is fantastic @bro2dragons or should I say Khaleesi. DarkMagiciangirl wrote: @bro2dragons or should I say Khaleesi. I was wondering how long until this happened. My brothers, we shall make an example of this one. The one who calls herself the DarkMagician shall know the fury of the lord of earth, sky, fire, and sea. Indeed! She is our great mother and the one, true queen of the Andals and the First Men. Great review. I'll have to find a new party game now. @FM_Alchemist Surprisingly, I found Wii Party U better than Mario Party 10.